June first and it’s ten months since we left Norway. Ten months – ten countries – ten years married. It’s been a good run so far. Another day starts off in the gym with a strength program followed by stretching. After breakfast we plan the rest of the day, and start planning for our stay in Ho Chi Minh city. It’s all very raw and little is done to polish it for tourists. From what we see of the island it’s pretty “unfinished”. The resort we stay at is beautiful and very polished. Along the road into town the houses are run down and it’s little to see. Driving further on it’s not really that much this island has to offer outside of your hotel walls. From the pepper “farm” we go towards Sao beach. It’s the most famous beach on the island and said to be very beautiful. It is, but not without it’s dark sides. The sand it’s powdery and white, but as soon as the beach end away from the water is garbage and dense vegetation. The restaurants we walk through to get down on the beach do not tempt us for lunch. I’ve brought my snorkeling gear today. Apart from the water confidence training at Mandirigma camp it hasn’t been used since Australia in October. It takes up a lot of space in the backpack and I’ll ship it home now. The waters out from Sao beach did not show one ounce of life. Dead. Like the Dead sea. Abandoned. Forgotten. Ok, good thing I’ve been bringing them along for this week. 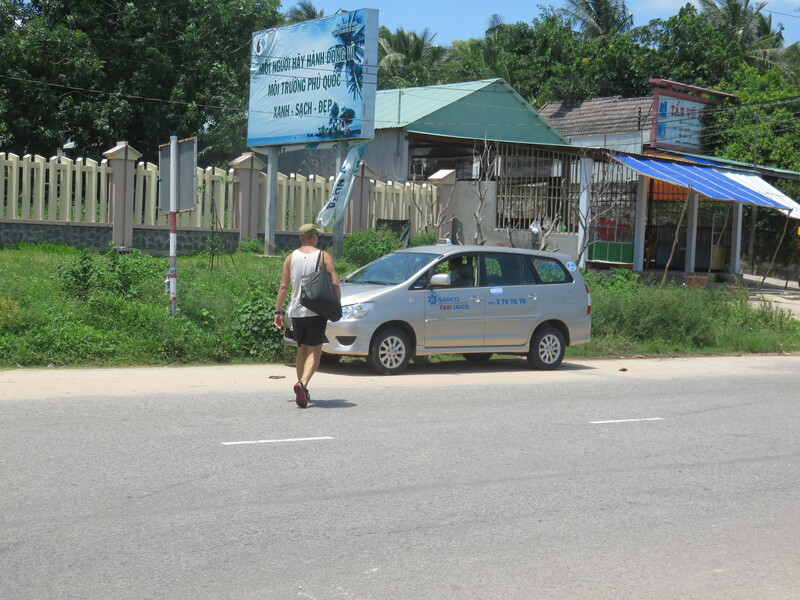 After swimming we wanted lunch, but the driver took us to the Phu Quoc prison. A.k.a. Coconut prison. This island was a prison island during the notorious war. It’s clear that history is written by the victor and the information along the walk is very propaganda based. “Wholeheartedly, Heroic, Patriotic” Nobody died, they all sacrificed. But the prison is a place worth visiting. It’s rebuilt to show approximately 1/50 of the total prison size. It’s still pretty big and the information claimed forty thousands prisoners where held her. The torture was beyond belief and it was Vietnamese who ran the camp. It was a part of the American war machinery, but run by the “puppet government” in the south.The prison feature a lot of reproductions of torture scenes and how the prisoners were kept. It’s illustrated by use of life size figures of both the captors and captives. It’s grotesque to see how much insanity can be found in the human mind. What people are able to do to another human being scares me. I’ve read about the prison online and agree with the one who said you run out of gas and interest after the few first houses. Going into one prison shack after the other to see these atrocities takes a lot out of you. We went through the tunnel that’s been built along the one used to escape the prison. That was maybe the best part of it. We ended outside the prison and walked back to the car. Now we needed lunch. Khem beach is just south of Sao beach we visited earlier, but a lot less developed. Our driver told us to go to a specific restaurant there and we did as told. The menu was not easy to understand and suddenly we had a large Vietnamese man appeared by our side. He was fluent in English and helped us order crabs and a steamed chicken. “They’re not that big”, he said. Turned out he lives in America and is home to visit old grounds for the first time in 25 years. We sat on the small plastic chairs and endured the flies for a while before the crabs were served. They tasted really good and we cracked them open and dug in. Then the chicken arrived. On the way down to the restaurant. Did I say it was “raw”? It’s some time since we were in Vietnam last and I had forgotten, or repressed, the fact that they love cartilage. The chicken was served with head and feet still attached and a scissor to cut it open. Opening it I found that lungs, heart, liver and more also was in place. Yummy. I think chicken is a overstatement as this probably was an old hen that failed to produce enough eggs these days. It’s tough and chewy, and the taste is nothing to spend too much time writing about. I still ate my fill because it was now three o’clock and five hours since breakfast. The restaurant was quite popular and suddenly it was a family party next to us. We had to move our table further in and make room for a noisy, but friendly, group of locals. Beers were brought out by the case of thirty at a time and barbeques placed on the table. Party on, Wayne! Our driver had found a spot in a hammock inside the restaurant and he popped up like a Jack-in-the-box when we exited and took us to the car. The ride home was smooth and easy. 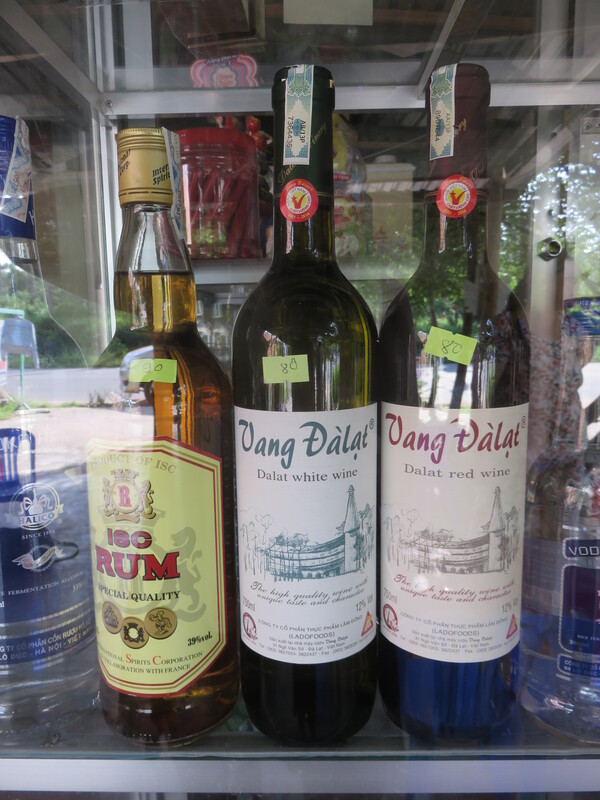 We even got the laundry back on the way home and Katja bought a bottle of local Vietnamese white wine. It was later described as “Totally fruity”. I settled for a few cans of Bia Saigon. Again, why change a winning formula? After showering and just relaxing on the balcony enjoying the fruity wine and a couple of beers we went out for dinner. It’s music playing loudly somewhere close and we walk down the street to take a look. It’s a wedding going on and it’s a lot of people gathering in a party tent outside a restaurant. Karaoke is not less popular here than in other Asian countries, but it’s not like people can sing. I think everyone is appreciated for their effort not for anything else. One of the hotel staff comes along heading for the party and inform us it’s a wedding. We wish her a great party and hail a taxi to take us to the night market. Katja wants more crab and gets barbequed crabs while I have a red snapper. Katja won. The crabs are delicious even though the meat is hard to get out off the legs because the barbecuing takes away the moist. Taste is brilliant. The snapper is nothing but ordinary, but I’m hungry and tear into it. Eating and cleaning fish with chop sticks is not easy. I pick a handful of bones out of my mouth during this process. Fruit on the way out of the market. Strangely I bought cookies instead. It’s popular to eat here and we’re smack in the middle of rush hour. Things you see here that’s seldom seen back home is the business men drinking with younger pretty girls. Katja had a great view to such a group where the spirit was high. Then the girls left the table for a while and the men sat silent, alone together, and drank. When the girls reappeared the spirit was once again high and everyone was loud and in party mood. Strange. The Vietnamese language and way of talking is loud and fast. You might have seen Vietnamese writing and noticed the different symbols over and under the letters like “ò ó ô õ”. This is indications on how the tonation on the letter moves. Downwards, upwards, up-then-down etc. Keeping up with this is impossible and when they shout at each other over your head it’s like being in a blender. And it happens all the time. How this will be in a city like Ho Chi Minh will be a thriller to find out. Back at the hotel we book us in on a cooking class Friday morning. Then Katja also sends an email to the board at our housing community to inform about a project we intend to take on when we get home. What we can’t achieve being on the other side of the world. Categories: Vietnam | Tags: Beach, Culture, Food, Phu Quoc, Vietnam | Permalink. Happy 10th Anniversary, both for wedding and travelling, in years and months!!!!!!!!!!! !